I was born in …….. I’m just kidding, I won’t go into quite that much detail. But if you truly want the rest of the poop, well here it is. Ed and I met the old fashioned way, in a bar, and just a few days after meeting he knew I was the ying to his yang and popped the question. Six months later we were before the judge at the courthouse and our lives were changed forever. We lived in Wichita, Kansas at the time and stayed there until the birth of Kenny, the Middle, when we moved to Newton, Kansas – that would be in 2000. A couple years later Ed’s brother, Vern, thought he’d be slick and bought all the nieces and nephews chickens for Easter. That single stunt changed our lives again. We kept the chicks at my MIL’s house and I drove out several times a week to clean the coop and take care of them. 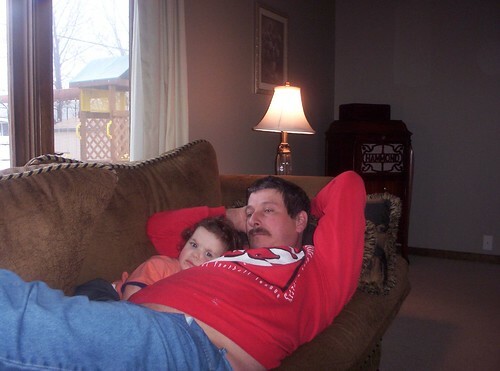 Ed and I began to talk about living in the country to keep our own chickens, maybe a cow or two, and even horses. Within the year we were shopping for land. As luck would have it, my midwife owned a farm just up the road about 15 miles and she’d recently moved to San Francisco with her new husband. Her deadbeat renter had moved out so she asked if I’d venture out to the farm to see it’s condition and as I pulled in the driveway I remembered all those afternoons visiting there with her and her family. I was home. Ed came out with me one evening and we decided to ask her what she would sell it for. A week later we were moving in. And three years later we couldn’t be happier. Our home was built in 1908 by the son of a Russian immigrant named Unruh. A father and two brothers came over from Russian to settle in the New Country – the father’s house is a mile over and the brother’s home is across our road about half a mile. One remaining brother stayed in Russia to care for the elders then later moved into Canada where he became a fixture in the government. Last year his relatives traveled down here from Canada and we opened our house so they could tour – in return they invited us to the family get-together in Goessel. We went, happily, as you can’t keep me away from fantastic potluck dinners if you tried. The home has lots of interesting details and quirks which I’ll be writing about (with pictures) from time to time. Let me introduce you to my guys. We’ll start with Ed. Aint he cute? Vincent doesn’t appreciate my photographic abilities. Eh, really nobody else does either and with my crappy camera I don’t blame them. No one EVER pictures well with this ancient piece of plastic. Then we have the boys. 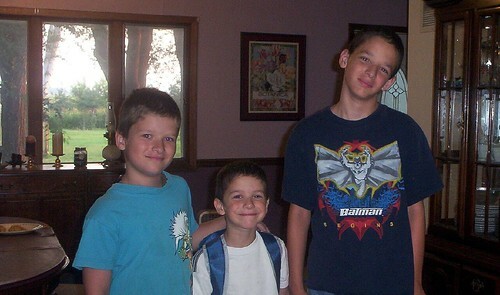 This here’s Kenny (8), Vincent (5), and Darren (11) on the first day of school 2007. I’m also know as Loopy which anyone who’s ever talked with me will understand and call it a perfect nick. I have a quirky sense of humor which my husband calls a “lack of” but he just doesn’t get me. I’m kind of a cross between Lilith from Cheers and, well, OK, I’m pretty much just kind of like her in the humor department. Dammit.